Gale Crater, the landing spot of NASA’s Curiosity Mars rover, has a three-mile-high mound at its center called Mount Sharp. Image: NASA/JPL. For forty years, astronomers have puzzled over the miles-high mounds rising from of the centers of Martian craters. Scientists have finally pieced together an origin story for the weird geologic pimples—and it reveals a critical moment in the Red Planet’s history. The mounds were sculpted by wind, following a shift in Mars’ climate that caused all the liquid water to dry up 3.7 billion years ago. That’s according to Mackenzie Day, a graduate student at the University of Texas at Austin, who led a clever new study to recreate the formation of the mysterious features and examine their distribution across Mars. Her work highlights how the shapes and patterns we observe on the Red Planet’s surface can help us peer deep into the geologic past. Sediment-filled craters on Mars (top) in different stages of erosion compared with results of a crater model in wind-tunnel experiment (bottom). Warm colors indicate high elevation, cool colors low elevation. Image: Mackenzie Day. Mounds were first observed in Martian craters during NASA’s Viking program in the 1970s. 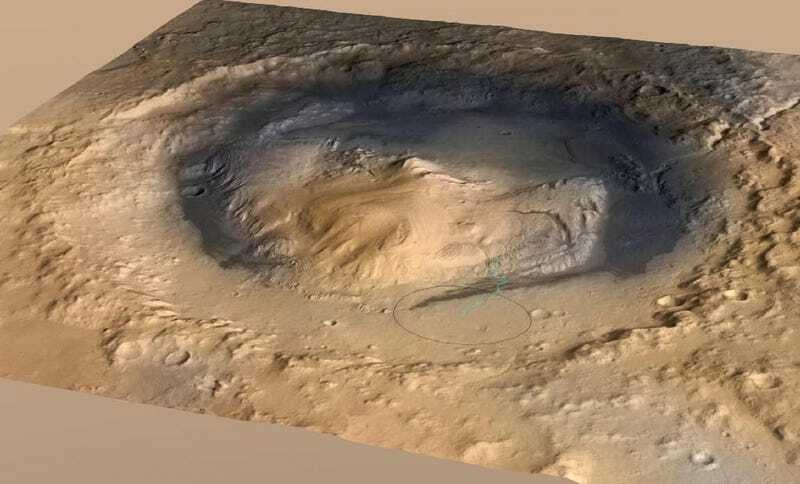 Gale crater’s famous Mount Sharp, which the Curiosity rover has been painstakingly ascending for the better part of a year, is a three mile high mega-mound, but smaller versions are found across the Red Planet. While scientists have suspected that the mounds were sculpted by wind, Day is the first to show that the physics actually makes sense. To do so, she built a miniature, 30 centimeter-wide “crater,” filled it with damp sand, stuck it in a wind tunnel, and watched what happened. Over time, her model was able to perfectly reproduce the mounds we see in Martian craters today, including the crescent-shaped moats that form around crater edges. Mars used to be a much wetter planet, perhaps covered in oceans of liquid water. By studying the location of more than 30 actual mounds, Day concluded that the transition from a wet to dry climate which led to their formation occurred nearly four billion years ago during the “Noachian” period. As scientists continue to study the mounds, we can expect to learn more about how Mars became a barren wasteland long ago. Personally, I just think it’s awesome that the three mile high mountain in Gale crater is basically a giant, compressed sand dune. As Day noted, something like that could never happen on Earth.